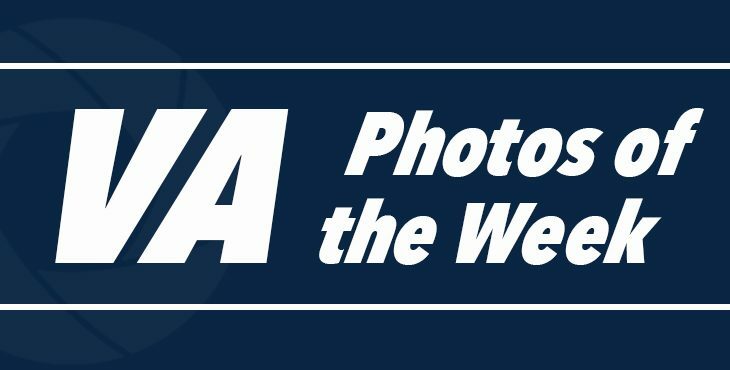 “VA Photos of the Week” highlight the connections made between our employees and the Veterans they serve every day at VA medical centers, regional offices, and national cemeteries across the country. This week, photographers from Albuquerque, Dallas, Harlingen, and Milwaukee shared their best images with us. Want to see the newest VA photos and #VeteranoftheDay stories? Follow us on Instagram at www.instagram.com/deptvetaffairs. 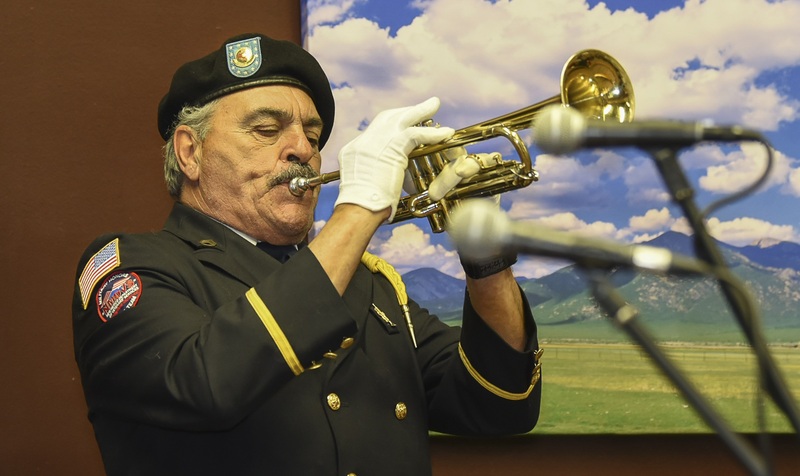 Alfred Bourquet moved the audience to tears with his performance of Taps during the Former Prisoner of War Ceremony that took place at the Raymond G. Murphy VA Medical Center in Albuquerque, New Mexico on April 3. On April 9, a number of VA Medical Centers and VA facilities observed the National Former Prisoner of War Recognition Day. We honor the courageous men and women who endured brutal treatments at the hands of their captors and yet, displayed incredible perseverance during their captivities. Photo by Dominic B. Ruiz, New Mexico VA Health Care System. U.S. Army Veteran David Janke meets with the Amputation Specialty Clinic team at VA North Texas Healthcare System. Dallas VA Medical Center is one of 18 Level ll Polytrauma Amputation Network Sites within the VA to provide specialized care to our Veterans with limb loss. Janke is one of 70 Veterans who will visit the Amputation Specialty Clinic team over one of four service days this month. 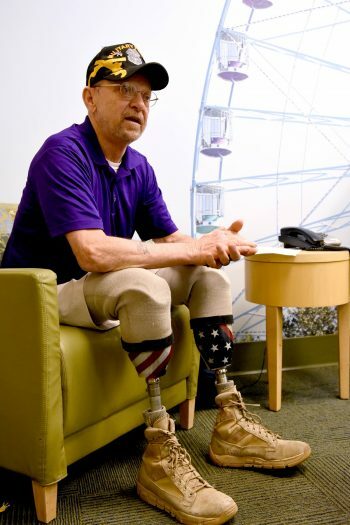 The team consists of an amputee medical director, a coordinator, a certified prosthetist, physical therapists and occupational therapists that aim to brings mobility and freedom to amputee Veterans. Photo by Jennifer Roy, VA North Texas Health Care System. 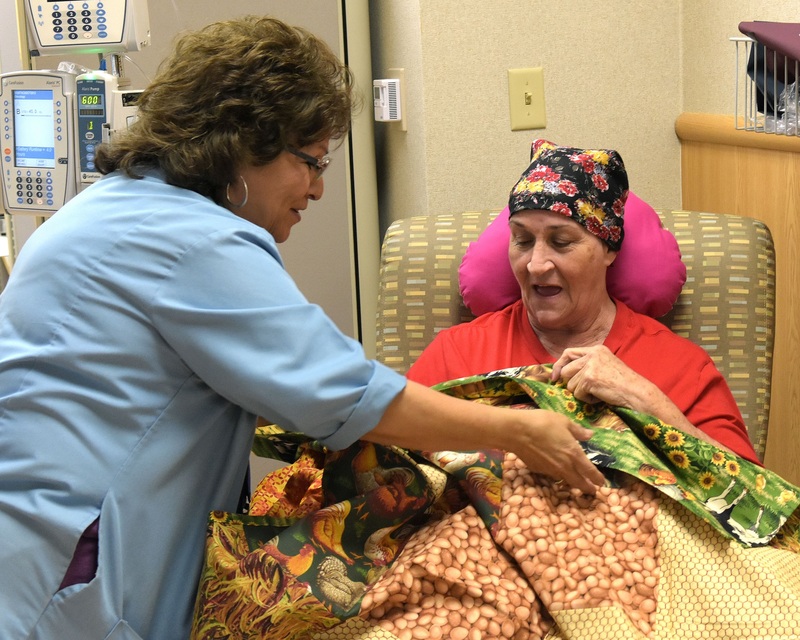 Barbara Dozier, a Vietnam era U.S. Army Veteran, was all smiles when Teresa Hill of the American Legion Auxiliary and 15-year volunteer, came into the chemo treatment clinic with specially crafted gift bags for our Veterans. Dozier served as an Army medic in San Antonio from 1968 to 1971. Photo by Michael Cole, VA North Texas Health Care System. Trudi Groth digs into some vittles! 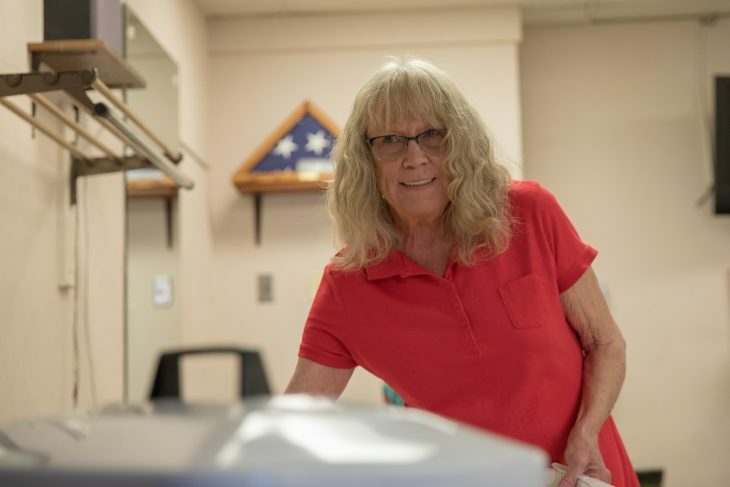 She has been a volunteer at Milwaukee VA Medical Center for nearly five years and she helps run the coffee and cookie cart at the main entrance of the hospital. Voluntary Service staff at Milwaukee VA host an appreciation breakfast for the 800-strong contingent of volunteers aiding in services ranging from pastry delivery to delivering patients from as far as Green Bay. The VA has over 75,000 who contribute over 12 million volunteer hours for Veterans across the nation. To learn more about volunteering with the VA, go to: https://www.volunteer.va.gov/. Photo by Benjamin Slane, Milwaukee VA Medical Center. 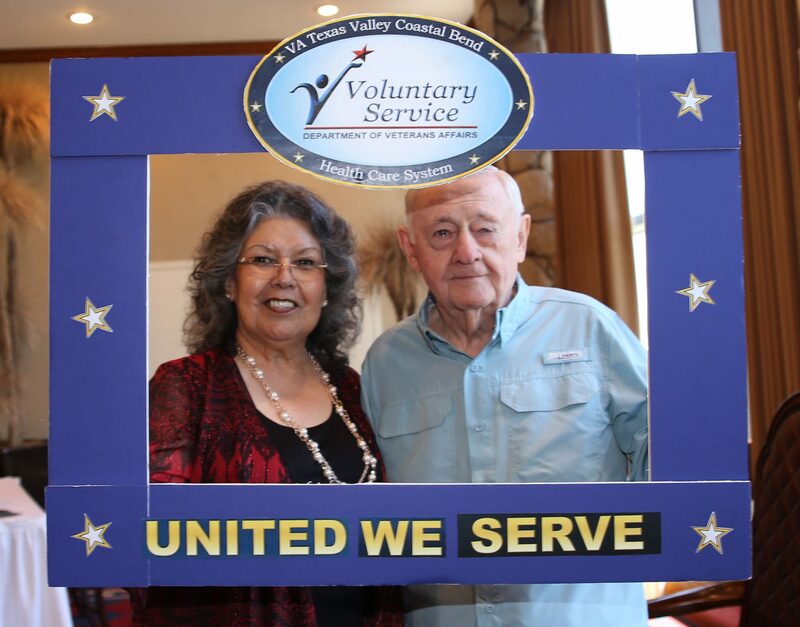 In an effort to recognize our volunteers during National Volunteer Week, VA Volunteers Jim and Aurora Flohr pose for photo during the 2019 Volunteer Recognition and Awards Luncheon held on April 8. The Army Veteran and his wife have volunteered for eight years at the VA in Harlingen, Texas, and have amassed more than 2,450 hours individually and almost 5,000 hours combined. Volunteers from the VA’s outpatient clinic and health care center in Harlingen, Texas, were treated to lunch and presented with awards for reaching milestones in hours of volunteerism in support of programs and services provided to Veterans and their families at VA Texas Valley Coastal Bend Health Care System. Photo by Luis H. Loza Gutierrez, VA Texas Valley Coastal Bend Health Care System. Emily Ma is graduating senior with a BA in Political Science from CUNY Hunter College. She is the project manager for social media and Instagram content under the VSFS intern program with the Digital Media Engagement (DME) team in Washington, D.C. Wish all that worked at a VA CENTERwere veterans. Maybe that way the ones you meet at the VA center would know how PTSD veterans are suffering. The ones that are just regular people don’t understand a Veterans problems, and not just brush it aside. Praise the Lord for the great Volunteers at the VA in Temple Texas. Was in the hospital for help and strengthing after 2 serious surgeries. The Doctors and Nurses were great but the Voluntekoo nkers were uplifting and gave me comfort as I was in for over a month! Was in the hospital for help and strengthing after 2 serious surgeries. The Doctors and Nurses were great but the Volunteers were uplifting and gave me comfort as I was in for over a month!